Just letting you know that we had the greatest trip with you! 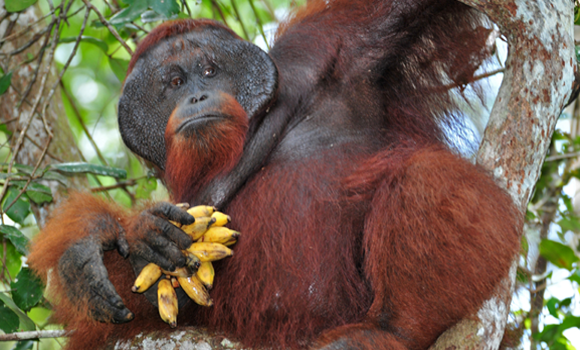 Your knowledge and love for the Orangutans is amazing. The service you and your crew provided were second to none. This trip will stay with us forever. We hope you get your dream of having your own tours. You deserve it. We will be back when you do!" It was an amazing experience,we spent one night at Fardi's guesthouse, really nice, clean, great room and great food, Fardi is very kind and friendly. We spent the next 4 days and 3 night on the "Let it go" boat, it was an incredible experience. We have slept on the deck with the sounds of nature, we have seen every kind of animal and we have eaten very well thanks to our cooker, Ida, and we have tried a lot of typical dishes. Ponco, our guide, was super, he know English very well and Spanish too and we teach him some Italian, he know a lot of things about the wildlife and was always smiling. The crew (Esson,Anjas,Ida and Ponco) was very kind and friendly, we played cards all together the night before sleeping. They kept the boat clean and tidy throughout the trip and they changed every night the sheets. We would recommend it to everyone! "Highlights included having the opportunity to observe orangutans and proboscis monkeys in their natural habitat, walking through the rain forests, travelling the Sekonyer River and the spectacular night sky. The trip was made even more memorable because of our guide FARDI who organised everything for us perfectly. His knowledge of the region is perhaps unparalled. This coupled with his respect for the environment and genuine enthusiam towards trying to make this a special holiday for all his visitors made this a holiday to remember. Aim to visit again in the near future…"
"Maybe one of the finest place in the world to see orang-utans in the natural environment!!! You gently cruise along the river through the rain forest and have excellent possibilities to watch these unique characters….must see!!!" "I wish I could have stayed longer in Borneo and do a longer trek. It is an amazing place! I went on a three days two nights boat trip to visit the Tanjung Puting National Park, which is said to be the best place to spot orangutans. We saw both wild and habituated or rehabilitated. The experience of seeing these endanger experience in its habitat is worth visiting although it is pricy. There are many tour agencies offering packages. I got different quotes and decided to go with an agent that was recommended in lonely planet forum despite he didn’t have a website as other tour operators. I am so happy I went with him instead of the other agencies. His name is Fardi. He is reliable, fast, resourceful, helpful and gave me the most competitive price among the five agencies I contacted. The boat was simple but well equipped, and our boat crew was wonderful!" "The boat was wonderful, comfortable, clean and was well set up with several sleeping and sitting options. The food was excellent. We had the boat to ourselves, 2 people and slept on deck under a mosquito net, it was magic with the forrest sounds and fireflies. Travelling up the river was so nice and serene the river is beautiful. 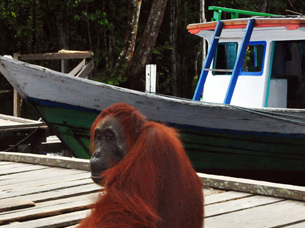 It was easy to spot various animals, especially Proboscis monkeys, birds and Orangutans. The walking into the forrest at the stops was easy, more like a stroll and the forrest was diverse. 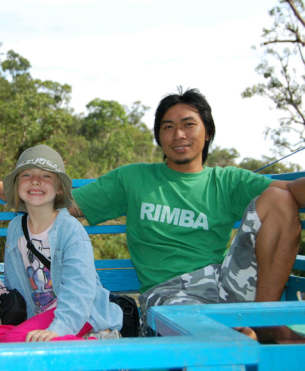 Our guide Fardi was very knowledgeable and friendly, he seems to get a lot of good reports and they are well deserved…"
My friend and I explored Tanjung Puting NP with Fardi in April 2013. I initially contacted several guides while planning our trip, and Fardi was always quick to respond, answered all my questions, and was reasonably priced. I work in the eco-tourism business myself with an endangered species so am (probably overly) sensitive to rules and regulations surrounding viewing animals in the wild. Too many times I’ve had guides that totally disregarded the rules in an effort to give us a “better” tour (and, no doubt, hoped to receive a better tip). But Fardi really respects the orangutans which I appreciated. His crew was also top-notch – very friendly, helpful, fun, and the food was amazingly good! I can’t recommend Fardi enough – you won’t be disappointed. Although it takes a bit of effort to get there, it’s worth it as this is definitely an experience you’ll never forget.